So this is definitely one of the more ridiculous things I've ever received via e-mail, but I figured hey, what the heck, I got nothing else today otherwise and frankly it's a Friday and I'm tired and just kind of feel like coasting into the weekend and enjoying Roy's start tonight against the LOLMets. 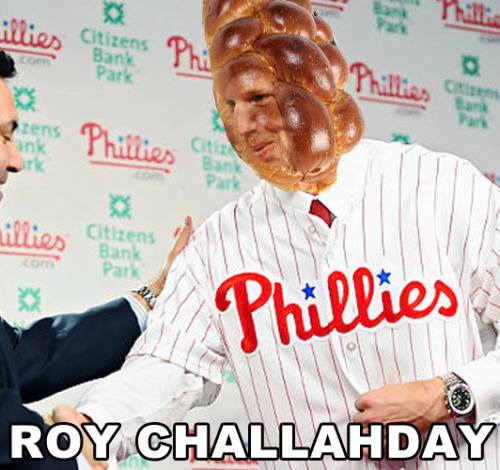 Happy Roysh Hashana, everyone*. Thanks (?) to reader Courtney for the link to this picture from the literally named website, Bread People. Yes, that really exists. And yes, I'm fully aware of the irony of a guy who has a website about wanting to go to the zoo with Roy Halladay saying that. Part one: "Raul ibanez is at the bar I'm at in the suburbs. He told me he liked my hat. Weeeeeeeeeee"
Part two (sent 2 hours and 26 minutes later): "He was wearing a man purse"
Well there you have it. Thanks, Anthony. Hope you had fun at unnamed suburban bar. Everyone knows that you eat round challah on Roysh Hashanah, to symbolize the circle of life and breaking of faces.